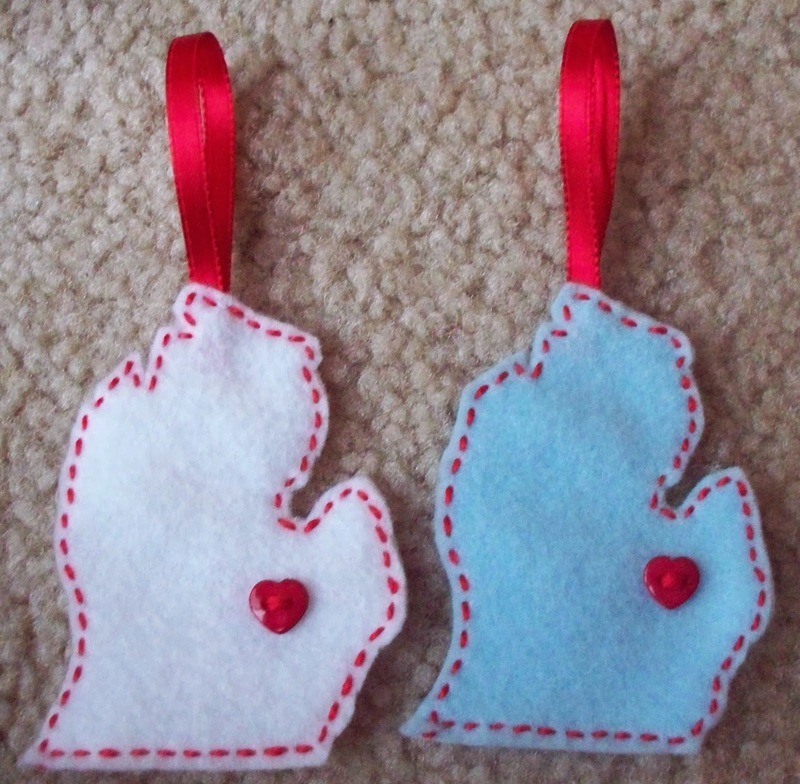 I love this concept so much, I made 8 Michigan ornaments. Michigan is a seriously tricky state, in terms of its design. By far, cutting out the shapes was the worst part, but surprisingly, it wasn't too difficult, and cutting went quickly. I have a healthy ribbon, floss and felt stash, so my costs, out of pocket, for this project were only for the buttons. I paid about $2 for 8 red heart buttons. My cost per ornament then is about 25 cents. I find this ornament incredibly impressive and lovely. First, find an image of your state online. Print out the image and adjust the sizing as necessary. I used my printer's handy-dandy custom setting to adjust the size of my copy. Cut out the image from cardstock. Fold felt together and pin. Pin the image to the felt and cut out the shape. By folding the felt together, you'll cut two shapes at the same time. Next, sew on the ribbon loop to the back piece of the ornament. I used white thread on all the ornaments. Seven of mine were white and one was blue. I ran out of white felt and I decided on blue because Michigan is known for its many lakes. Place your heart button anywhere you'd like on your ornament. I placed mine all in the same place as this is where all of my family and friends generally live. I like the idea of placing the heart where you live within the state, but you could just put the heart wherever, too. Sew on the button. Sew around the edges of both pieces of felt, sewing them together. Despite the hassle of cutting out all the felt, this project was super easy to do and incredibly rewarding. I thoroughly enjoyed making these ornaments. Really like but where is the upper peninsula?